Fugazi’s last album, 2001’s The Argument, begins with 53 seconds of static haze, lost/muffled radio transmissions and foreboding strings. Abruptly, it ends as soon as it begins, immediately sliding into the opening drum salvo of “Cashout,” the LPs first proper song and de facto call to arms. There is no mistaking this is a Fugazi album — and if you had any doubts, Guy Picciotto’s “Full Disclosure,” an aural punch to the face, makes that very clear. Released just four weeks after 9/11, The Argument is thus far the final statement by a band whose absence this decade has been keenly felt. Far from a by-the-numbers Fugazi LP, if anything the record comes off like a post-9/11 work — that or perhaps a prescient warning. Yes, you will find the themes and motifs that run throughout the entirety of the Fugazi canon (greed, corporatism, politics, corruption) only here they are synthesized and razor sharp. 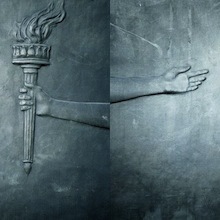 Trust me when I say Fugazi’s self-styled brand of checks & balances is sorely missed in underground rock. Capitalizing on the experimental growth exhibited on Red Medicine and End Hits, while simultaneously harnessing a ferocity in spirit not seen since 1993’s In On The Kill Taker, The Argument pulls not a single punch. It’s a subtle, white-knuckled, serious work with a breathing and rolling tension that repeatedly cascades in the span of its 45 minutes. This is the sound of a band immersed in synchronicity — one in which the ebb and flow of ideas, arrangement, vision and production all coalesce. 13 Songs, Repeater and In On The Kill Taker were the angst-filled records I fell in love with in high school and reached for in the ’90s. Artistically, seven albums into their career, I must now concede that with The Argument, Fugazi crafted what, creatively, may be their overall masterwork. And if it does turn out to be their swan song, it is a fine one indeed. OH man, excellent choice, J-Gage. Is it bad that I think that this is the best week? Hell yeah, Fugazi! Great choice. That said, I was studying for a semester in London when this album came out and I don’t know if I knew how to really digest it at first, but I like your interpretation of it throught he post-9/11 lens, despite its obvious creation before that moment. It’s an album that has grown stronger and stronger over time and it really stands as one of their finest moments in a career of fine moments. 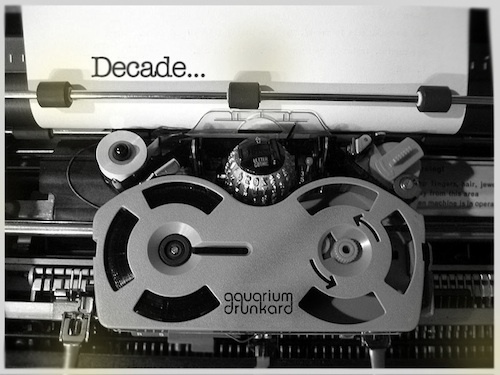 My favourite Decade entry yet. I’ll be seeing Guy in a few weeks as a part of Vic Chesnutt’s band and I’m shaking with excitement knowing it’s (sadly) the closest I’ll ever get to seeing Fugazi. @Kaley–Vic’s got a pretty great band; aren’t some of the Godspeed guys in it? @Kaley – I’m going to see Vic and Co. this Saturday. I’m terribly excited to see this band as they’ve recorded probably my favorite albums with Vic so far. Not to mention my first chance getting to see Guy play since the last time I saw Fugazi in 2002. Now, I’m really starting to get excited for the show. I’ve been so hung up on seeing Guy and have nearly forgotten I’m seeing some of the Godspeed folk, as well as Vic. Can’t wait. such a great album, it seems like if they curated an atp it would just be all dischord bands. as much as i love dischord bands like nation of ulysses, q and not u, warmers. i cant help but notice how much of a strangle hold ian mackaye or guy picciotto has on the sound of the records. most of the bands credit them with a level of producing, all the bands have a similar sound and as much as i like that sound, i don’t really think that its progressive. i like labels and areas of the country with a large variety of sound. not a crafted sound that fits an area. such a great record! righteous pick!